I am not about to surrender any plot details here, but I will start at the end: following the disappointing remake that was The Force Awakens and the overall mediocre feeling I was left with by Rogue One, The Last Jedi managed one thing very well: cementing the notion I am well and truly over Star Wars. The magic is gone; what’s left are mediocre space fantasy movies filled with special effects and tons of merchandising opportunities. Obviously, the devil is in the details. 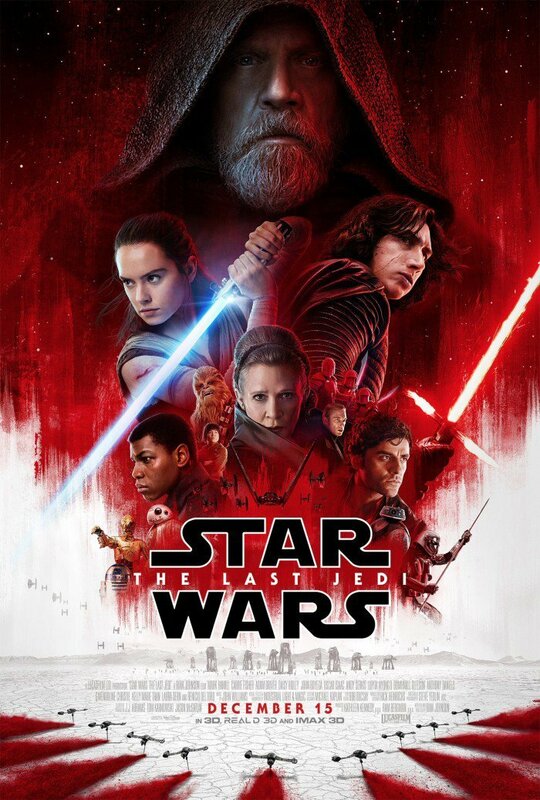 Unlike other movies in the series, which are not much more than a collection of loosely tied action scenes (these used to be imaginative, now they are just one more sample of CGI), The Last Jedi does offer us a palette of characters that are clearly struggling as they develop. Thus it clearly deviates from the old style of “bad guys did this therefore we need to do that”; things are not clear cut anymore. Further, Last Jedi is dripping with self conscience humour; I suspect these will end up as the movie’s main legacy to the franchise. Oh, and best of all, The Last Jedi is no remake of The Empire Strikes Back, as many (yours truly included) have feared, even if the two share a lack of Death Stars. Theme wise, The Last Jedi is about leaving the past behind, the extent to which this is done, and the varying ways in which this can get done. That theme goes with the bigger theme of leaving the Lucas era behind in favour of the Disney-ian world of Star Wars. Whether you consider the latter a positive or not, the above do not change the unavoidable fact The Last Jedi is still a very to-the-formula type film, the product of Superficiality Inc. Yes, we can see many (emphasis on "many") characters struggling, but perhaps the need to create an abundance of merchandising opportunities has left each such struggle as shallow as. There is little in the way of depth or background; they all do X, fail at it, and therefore do Y instead next time around. Sorry, that could work for a computer program, but it is not good enough when telling a human story. By far the brightest element of The Last Jedi is Mark Hamill, whose performance is better than I have ever seen him produce and generally leaves his character as the best thing to take out of the movie. And, with the risk of spoiling the movie for you, I will mention he can talk. The Last Jedi felt like a movie that passed by me. I wouldn’t call it boring, but it never touched, moved, or involved me in any way. It was just... Meh. 2.5 out of 5 crabs.